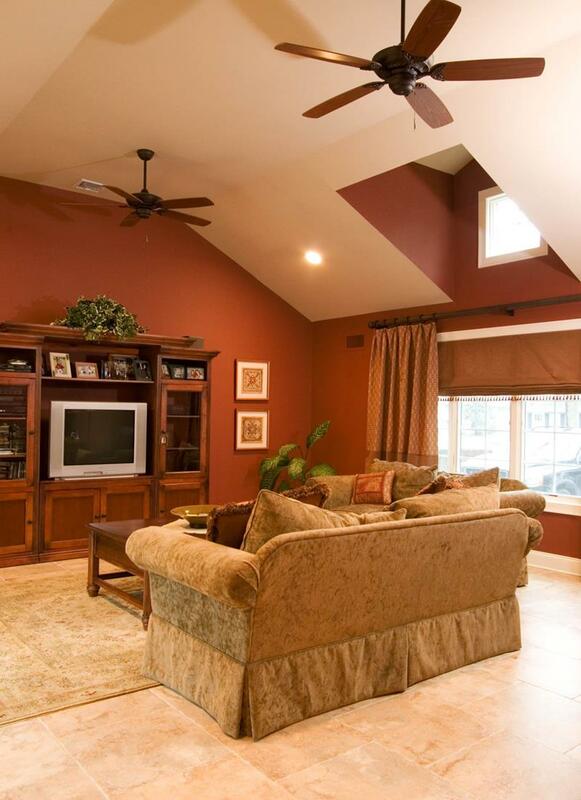 When it comes to colors for your living room, what comes to mind. Maybe earth tones, possibly some blues and lavender. We’re here to show you how versatile orange is. 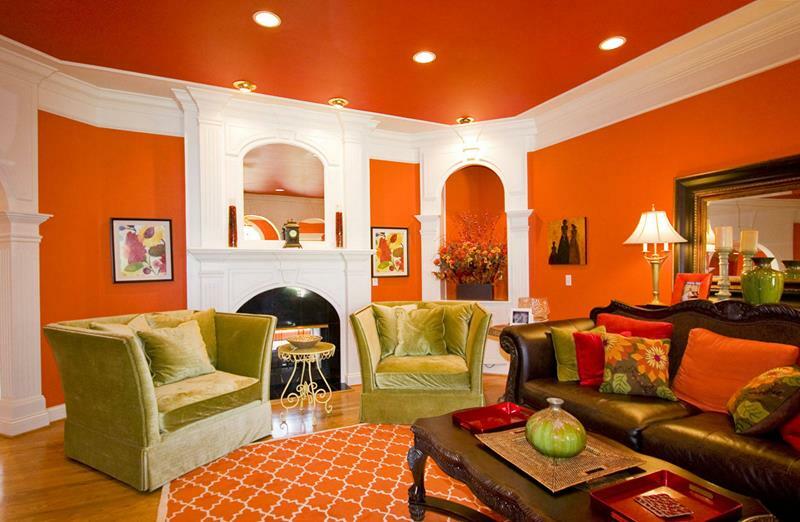 We know, orange isn’t the first color people jump to when planning a living room, but we’ll show you why it should be. 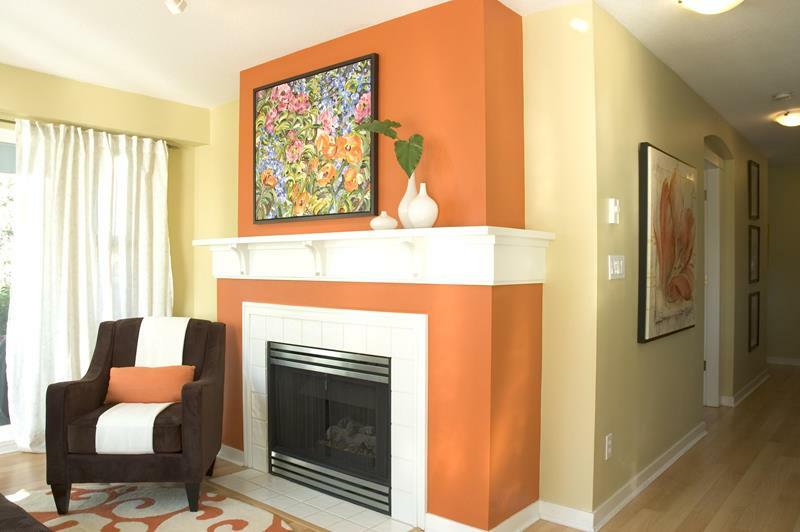 Below, you will see over 25 example of how orange completely changes a room. 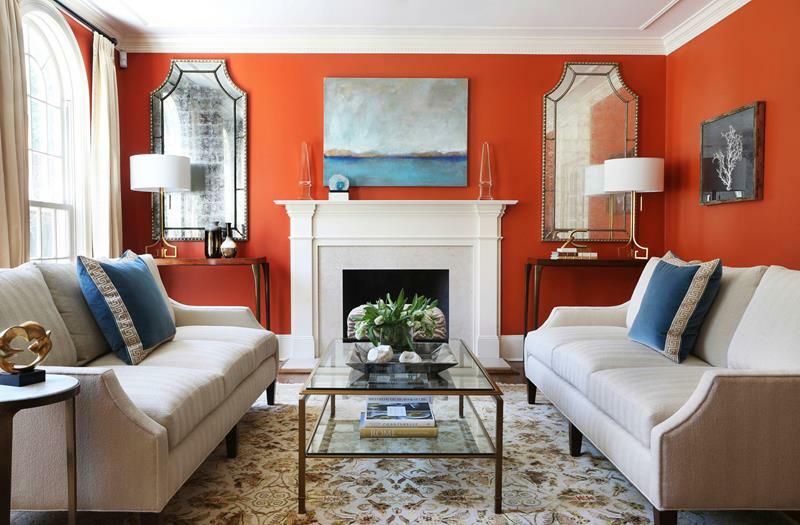 Yes, in some cases the orange is bold and daring, bringing the whole space to life. In other cases, the orange is calm and neutral, blending with other colors to bring peace to the space. By the time you’re done in this gallery, we know you’ll be going to the home improvement store to check out all the orange blends. There is nothing better than a calm, wonderfully toned orange. 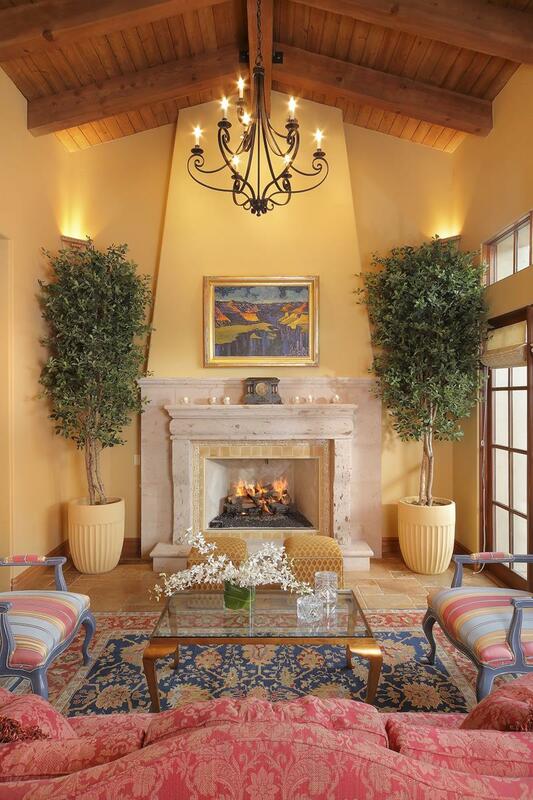 This fireplace area works so well with the surrounding wall color. 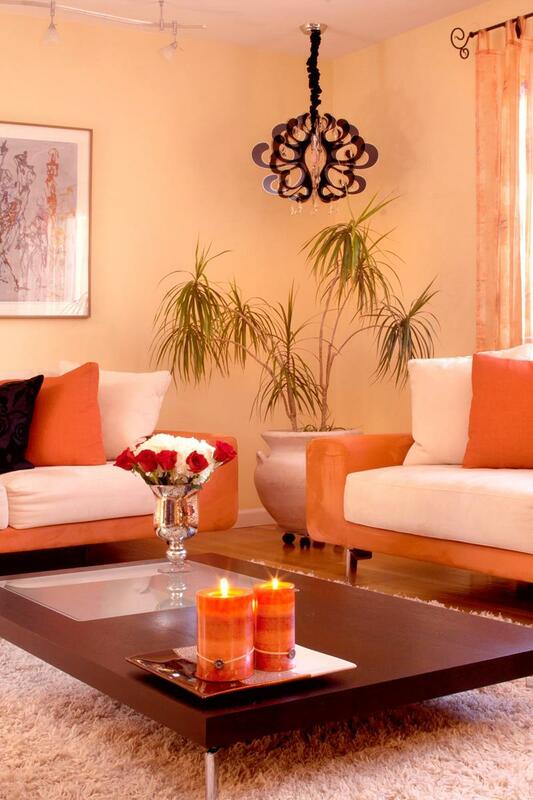 Orange doesn’t have to be an overwhelming color, as you can see how toned down it is in this living room space. It is peaceful and works with this contemporary decor style. 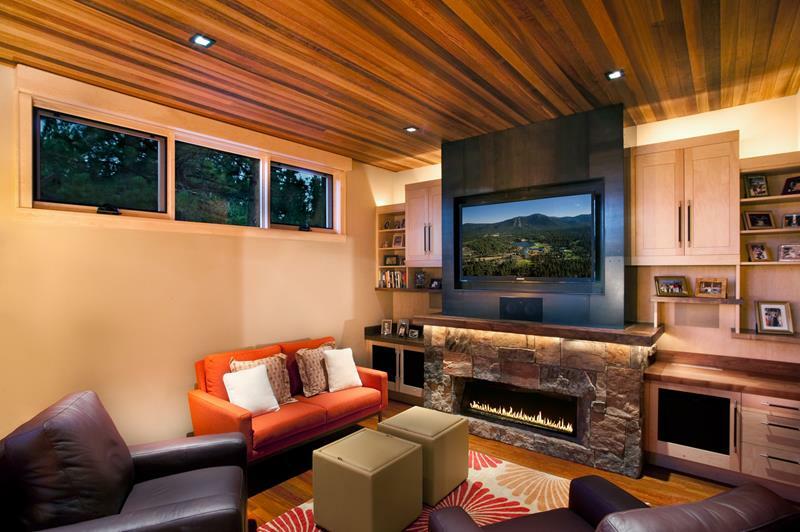 The orange used in this living room space is such a wonderful match to this bold hardwood ceiling. 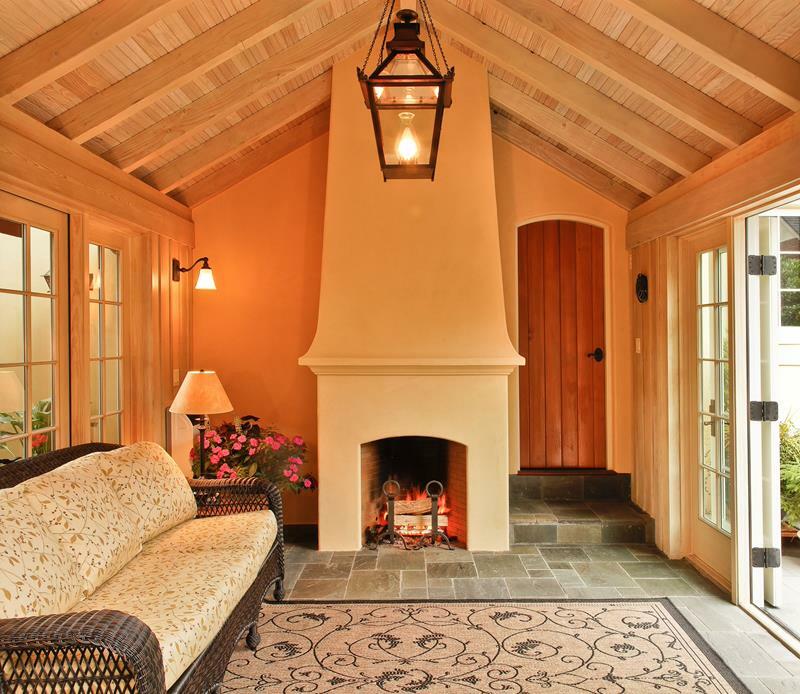 We love the warmth created by the overall style. This contemporary living room simply looks amazing. When you go with bold architecture, you can also go bold with colors and you can see how ell the orange works to complement this style. The darker orange used for the walls in this living room is matched so well by the hardwood furniture and calm couch and carpet. We love the overall contrasts. An orange color always works well with a cream color style. 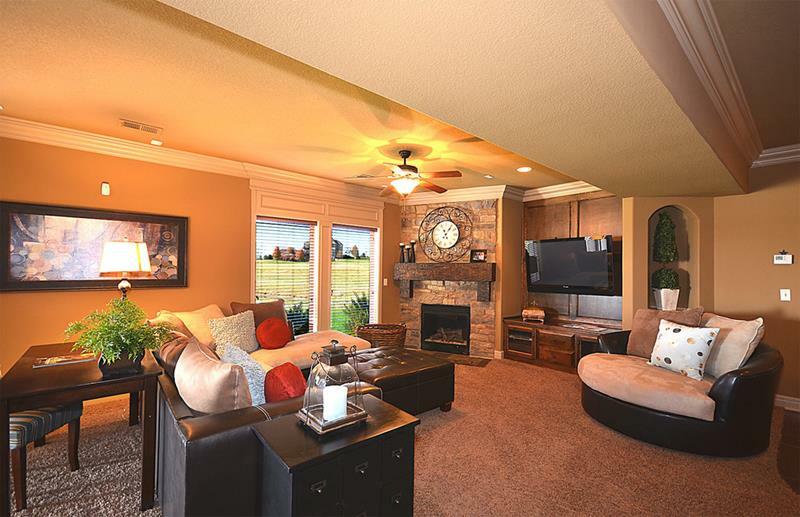 This room is a balance between the two, giving you an amazing and light style. 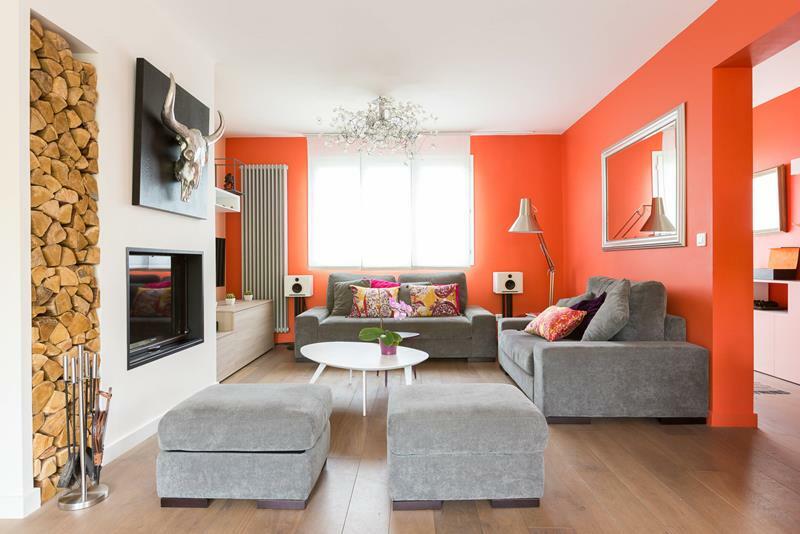 This room makes use of a bold orange and contrasts it with white outlines. The furniture is such a great match to the whole space, giving an eclectic feeling. This space takes a beautiful European style and makes it colorful. 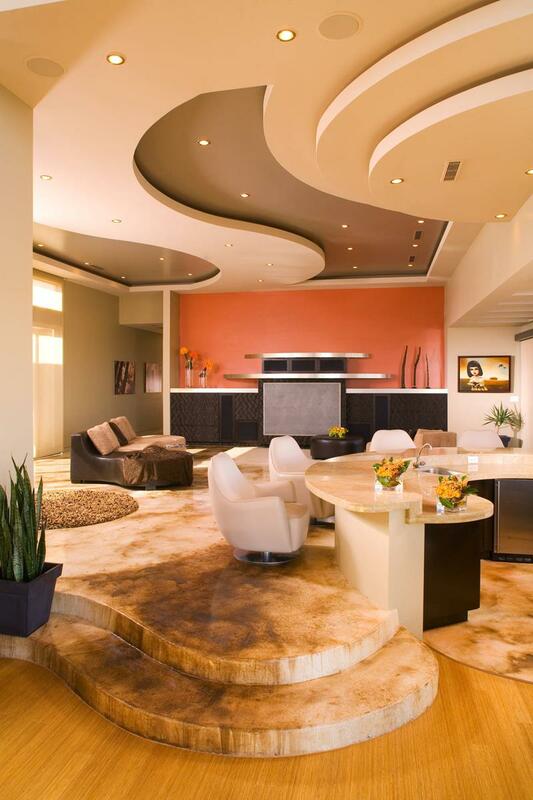 The calm orange used for the walls gives you a wonderful base for this fantastic furniture. 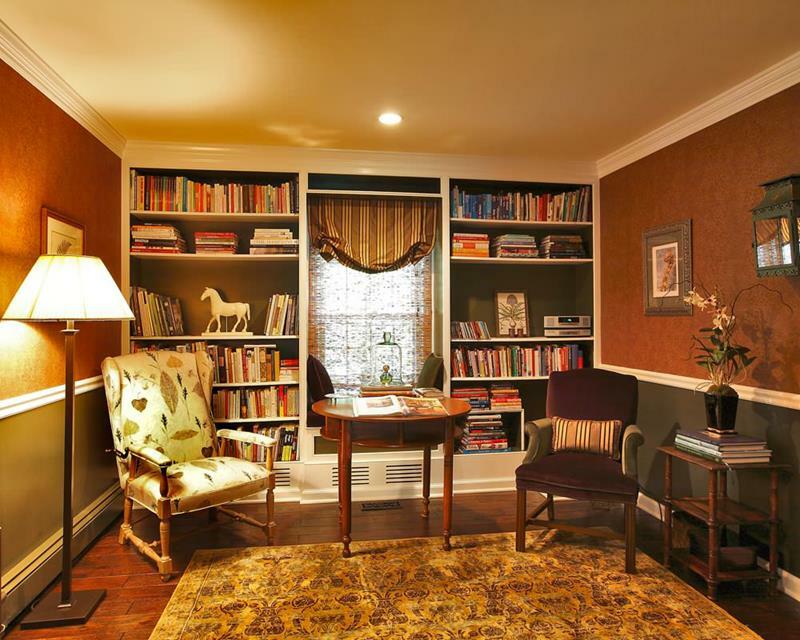 The darker orange in this small reading room really works well to give this space a calming country charm. We love the decor match here. Orange has always been a staple of a Southwest style and you can see it at work here. 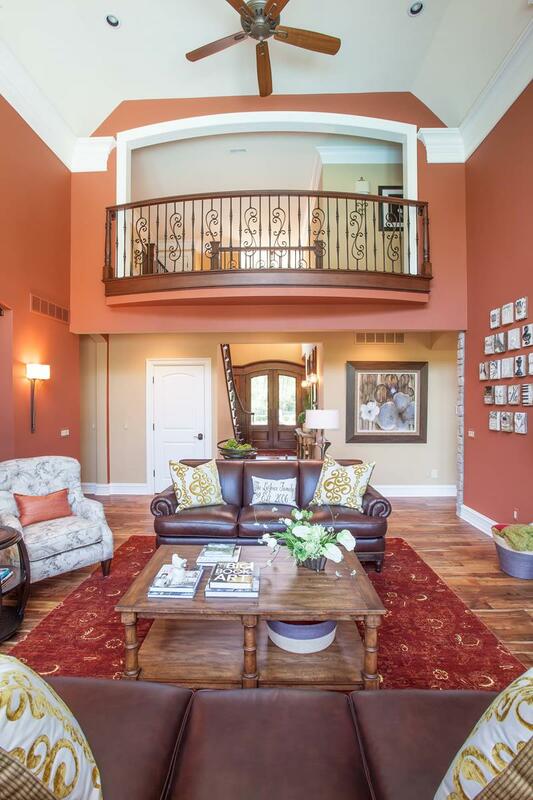 We love how great it looks in the abundant natural light. 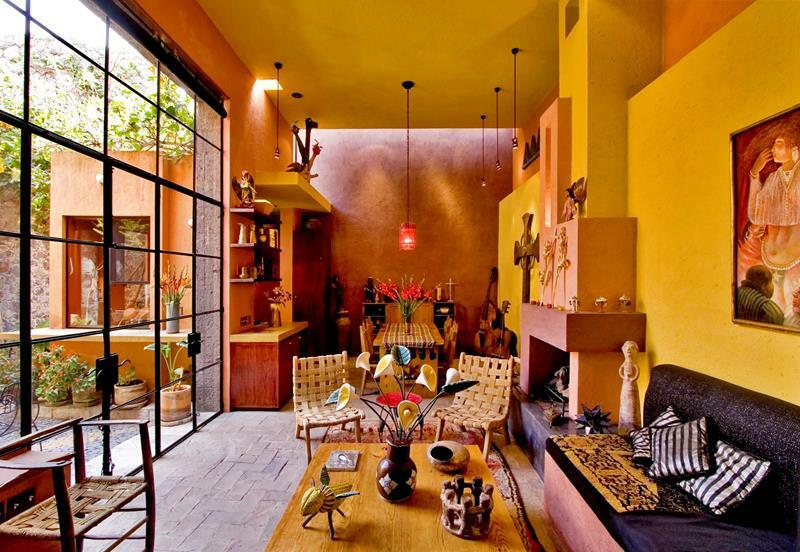 Here is another wonderful example of Southwestern architecture that is wonderfully matched by a calm orange tone. 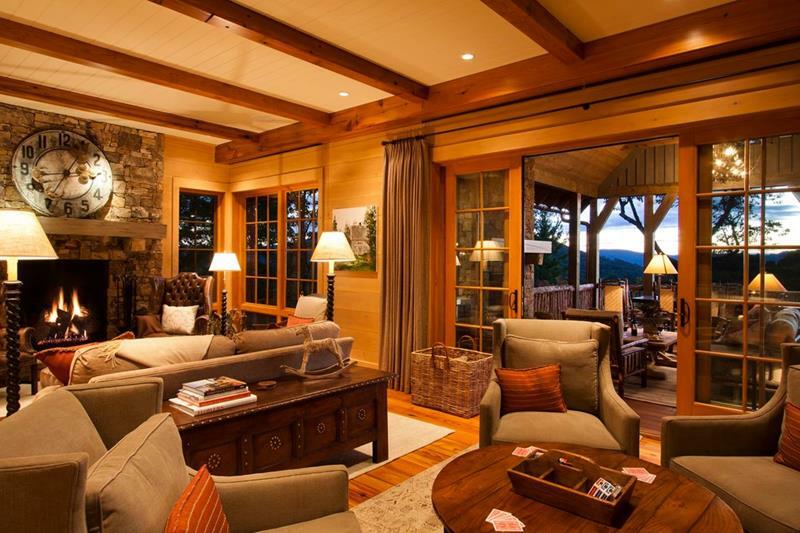 This is wonderfully complemented by the hardwood all around. 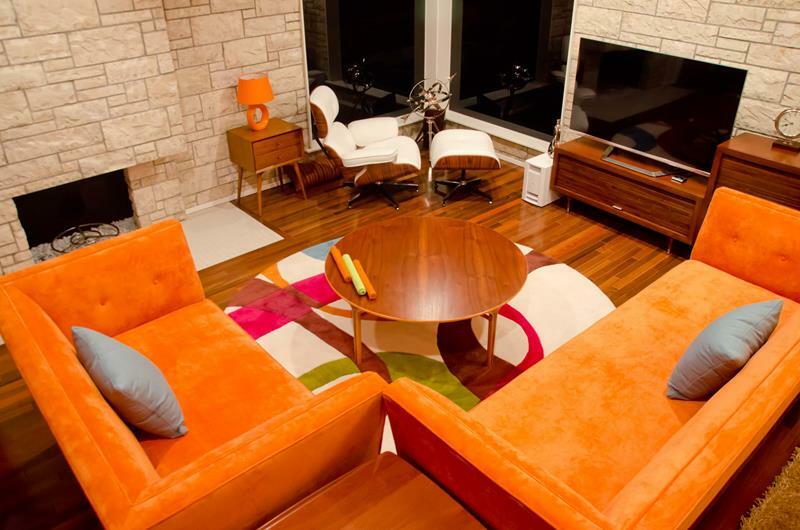 The orange here is creatively mixed in with the pillows, and we love how well the hardwood works to blend with that. The lighting here really does the job of bringing this room to life. 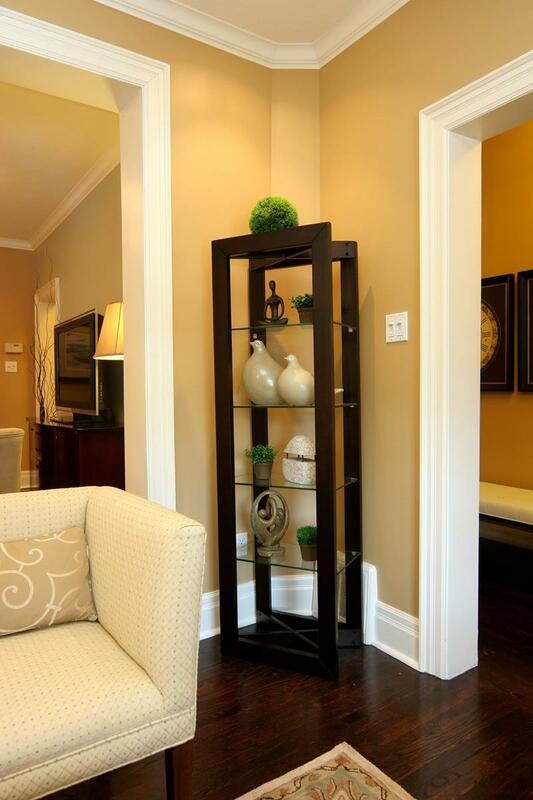 A light orange is used for these walls and is wonderfully blended with the light hardwood. 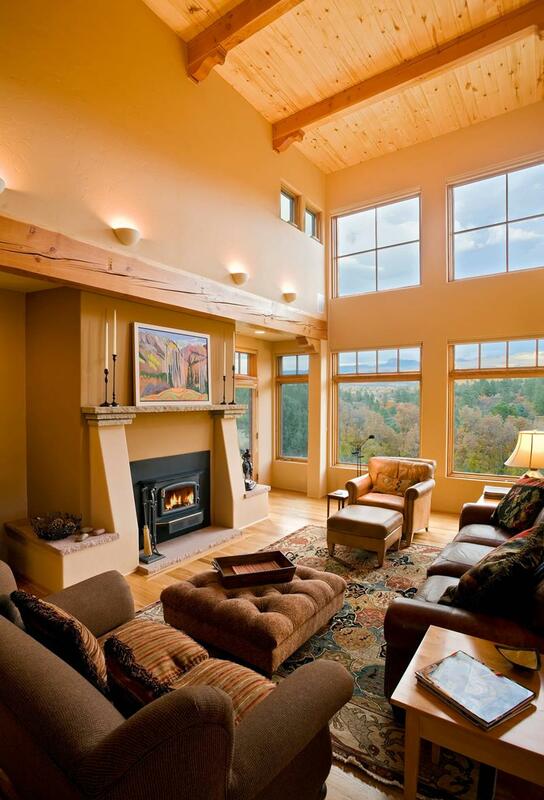 We love how the natural light pours in to show the whole space off. 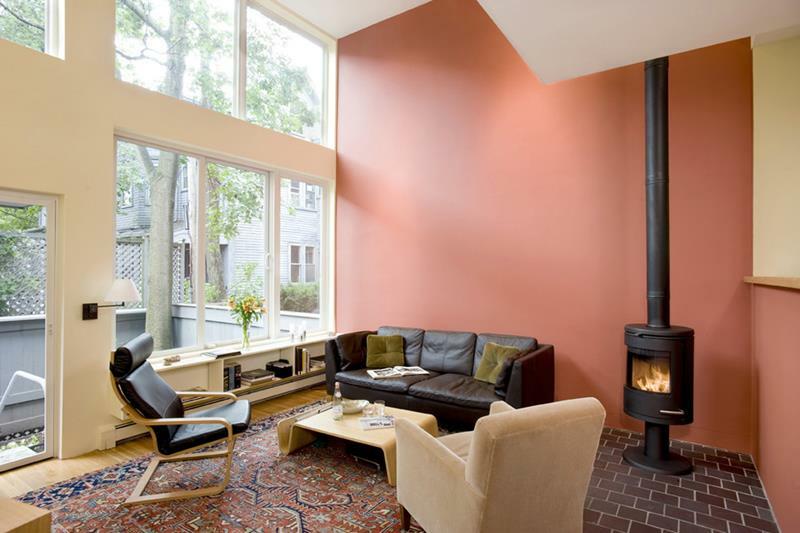 This darker, burnt orange is contrasted so well with the lighter ceiling and fireplace that you will be pleased with the result. The decor and furniture work to complete the look. 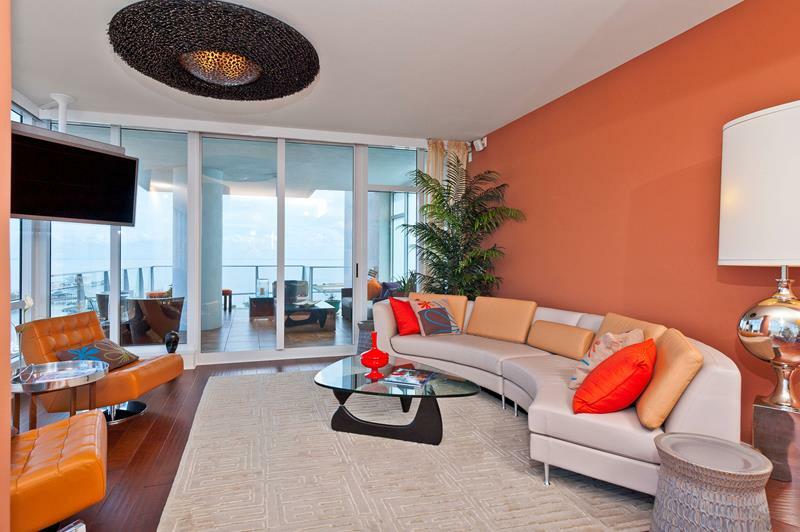 This hardwood ceiling is wonderfully complemented by this orange, modern furniture. This whole space is opened up so you can see how beautiful it really is. We love that these orange walls are balanced by the white ceiling. This space is bright, lively, and fun, giving you a contemporary style. 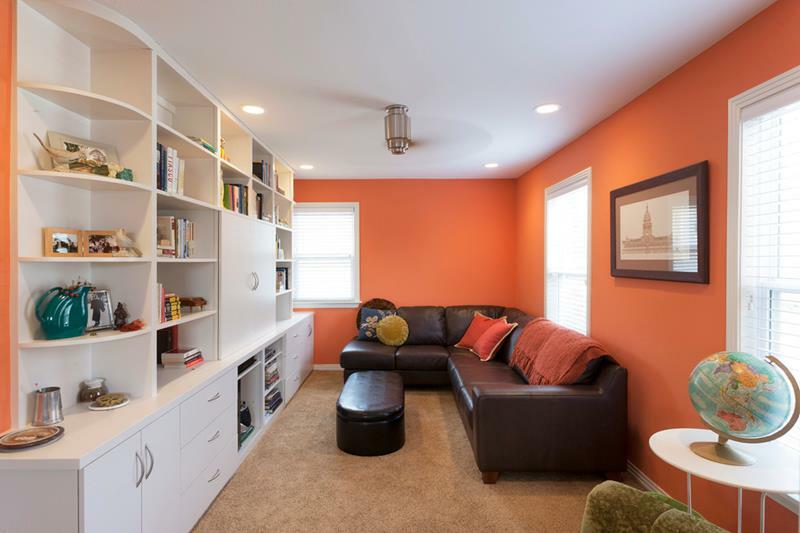 The calm orange used in this room is matched perfectly by the white shelving and television area. This is a calm and open space you can relax in. This room takes a slightly rustic style and makes if bright thanks to the calm orange wall. The modern furniture is a great contrast and complement to the whole area. Photo by Charlie Allen Renovations, Inc. There is nothing complicated about this living room. 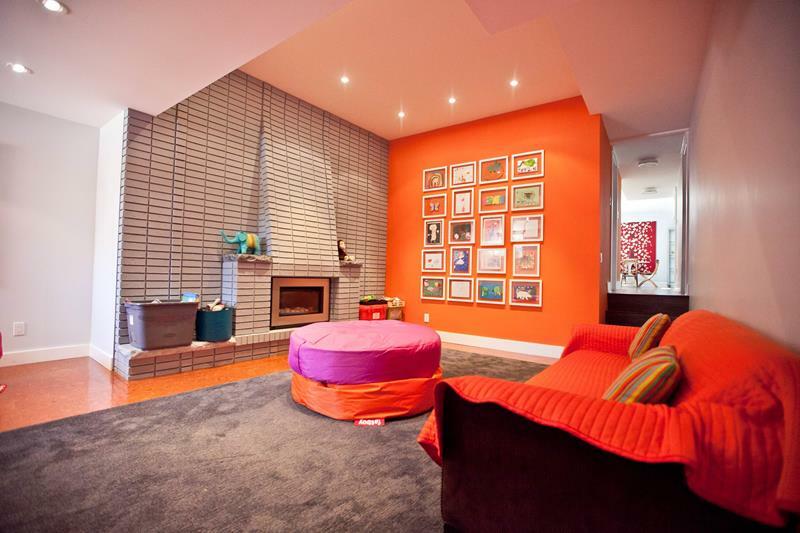 With the natural light pouring in to show this off-orange wall, you can enjoy the minimal feel of the space. With these wonderful stacked stone style walls, you can appreciate how well this bold furniture works to bring life to this room. 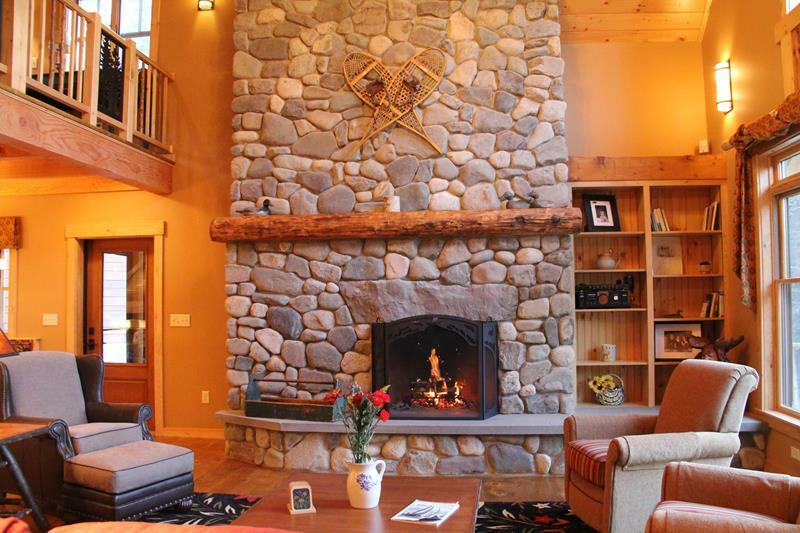 We love the cobblestone style used for this fireplace area. The subtle orange used for the walls is a great complement to the hardwood around the room. 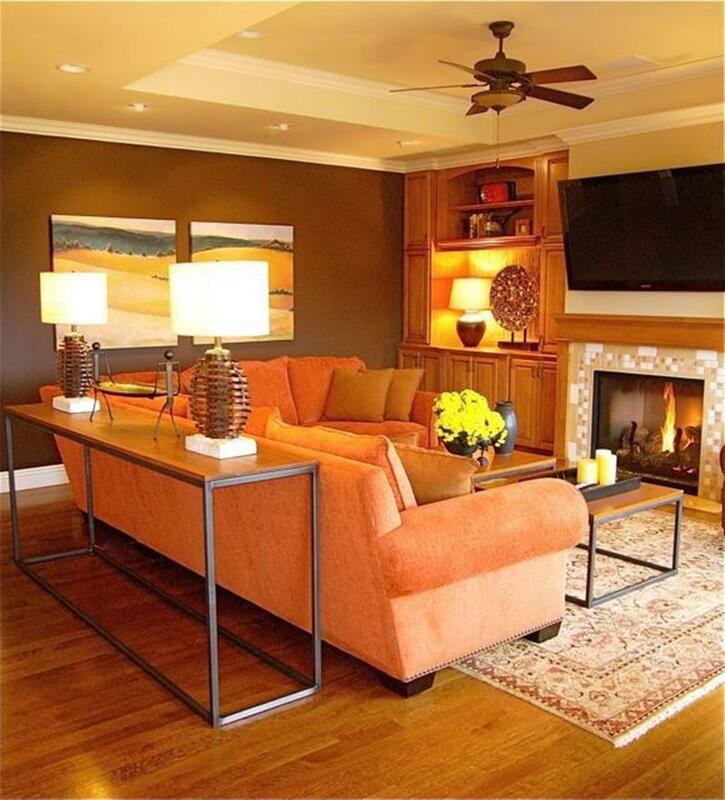 This darker orange is wonderfully complemented by the lighter furniture. 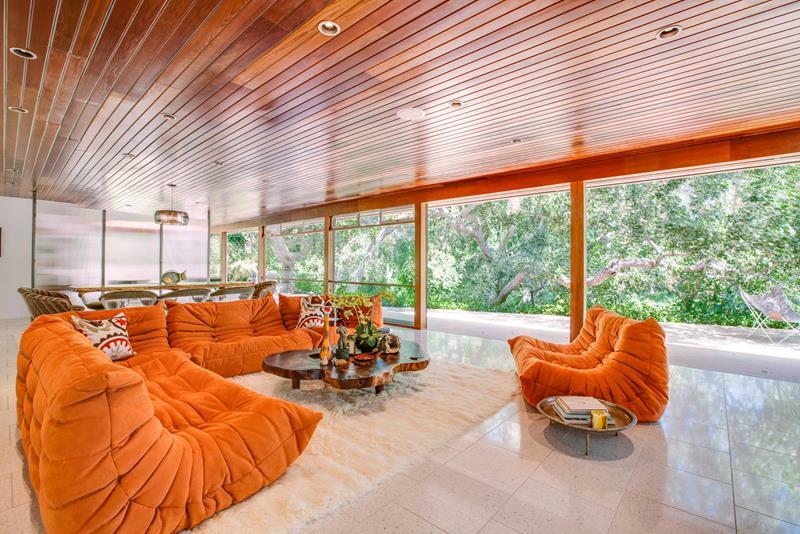 Don’t underestimate how well the accent pillows and chairs work to balance multiple orange tones. The hardwood in this room, from the floor to the cabinets, work so well with this light orange couch. 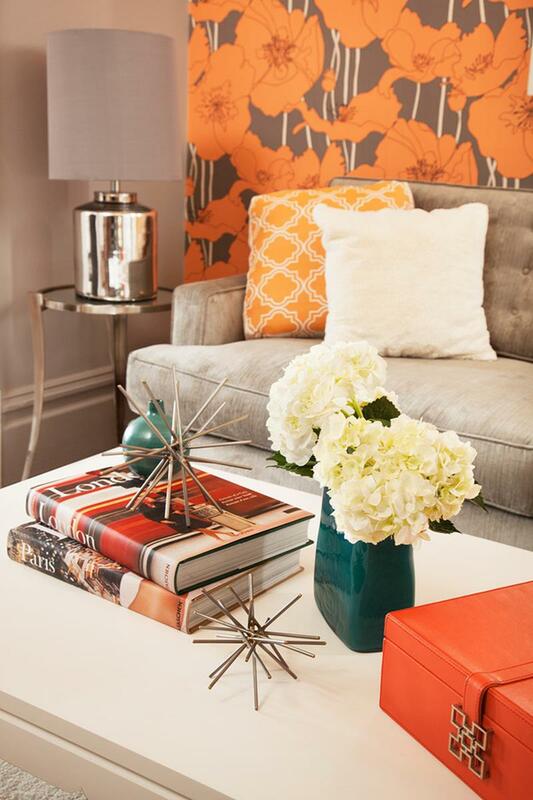 Sometimes orange works best as a complement to the room, as you can see with this patterned wallpaper and matching accent pillow. This room is grand and luxurious, making use of a very dark tone of orange. Some would call this a blood orange, coming close to a beautiful pink. We love how well the wall color works with the decor and furniture in this room to create a wonderful contemporary style. 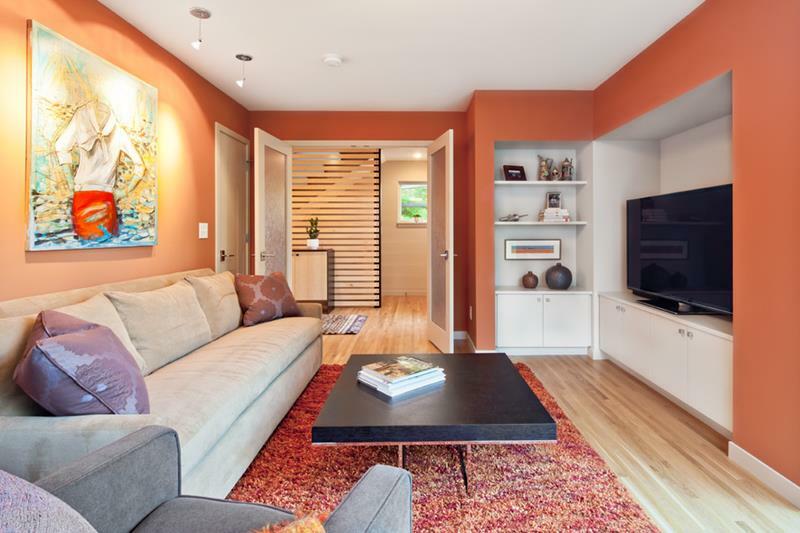 The bold orange in this room is met with a bohemian modern style that brings a fantastic life to this living room.